Jennie has big brown eyes, soft golden fur and a tail that won't stop wagging. Scratch behind her floppy ears, and she'll lean in for more. She even barks on command. But Jennie's not a dog. 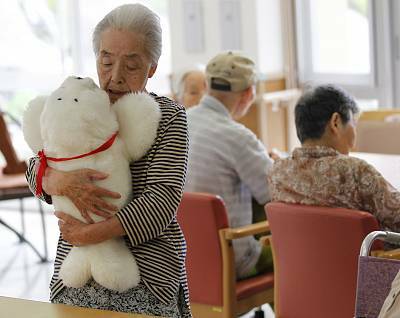 She's a prototype for Tombot, a puppy-like companion robot being developed by a Santa Clarita, California-based company of the same name as a tool for comforting people with dementia. Tombot is one of a handful of firms working on the next generation of social robots designed with seniors' needs — and fixed incomes — in mind. Loneliness is certainly a big problem for middle-aged and older adults, with a 2018 survey finding that about one third of adults over age 45 feel lonely. And more than 20% of people age 60 or older are affected by neurological and mental disorders, including dementia — which can trigger depression and anxiety along with cognitive problems. Research has linked animal-assisted therapy with improvements in mood and quality of life for seniors, including those with dementia. The jury's still out on whether robotic pets are as effective as their flesh-and-blood counterparts, but a recent review of studies on robopets for dementia patients linked time spent with the robots to lower levels of depression and agitation. And since they don't need walks, food or vet visits, cuddly automatons like Tombot are considered a low-maintenance option for people who are no longer able to care for a pet. "Pets play an important companion role whatever your age," Andrew Sixsmith, director of the Science and Technology for Aging Research Institute at Simon Fraser University in Vancouver, British Columbia, said in an email. "For some people with dementia, a real pet might not be feasible, so this might help." Monica Moreno, a senior director at the Alzheimer's Association, expressed similar sentiments. "Research around robotic pets and people living with dementia is somewhat limited and far from conclusive, but there is certainly anecdotal evidence to suggest that this kind of interaction may help some people living with moderate to severe Alzheimer's disease or other dementias," she said in an email. Companion robots have been on the market for years. 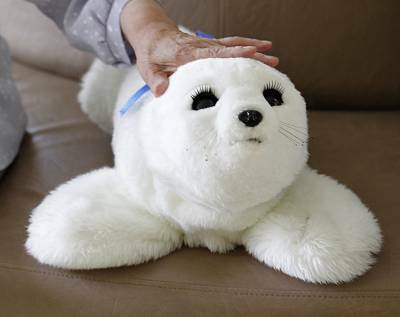 PARO, a doe-eyed seal pup used in nursing homes since the early 2000s, has been shown to calm seniors with its cooing sounds and gently waving flippers. 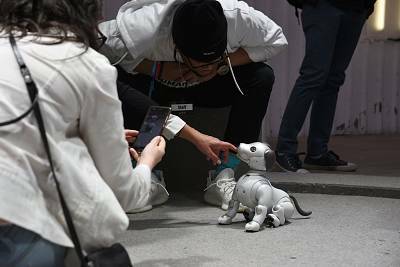 Newer arrivals to the market, like a 2018 reboot of Sony's beloved Aibo robot dog, are tricked out with internet connectivity and facial recognition. They're adorable and, with few exceptions, very expensive. 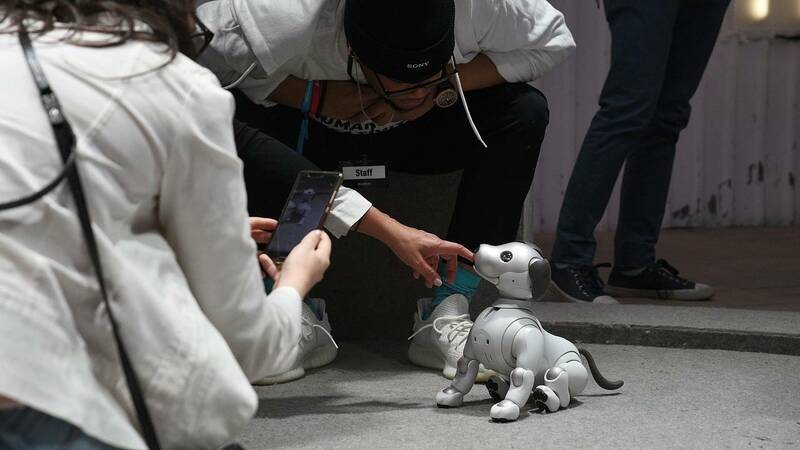 Aibo will set you back $2,900, PARO $6,000. Those price tags put high-end companion robots out of reach for many seniors in the U.S., where millions of older adults live at or near the federal poverty level. Tombot CEO and creator Tom Stevens learned this firsthand when he tried to find a robotic companion for his mother, who had to give up her beloved dog after being diagnosed with Alzheimer's disease. "They were either too simplistic, or they were ridiculously expensive," Stevens said of other robotic options. "There was nothing in the middle that was both advanced and affordable." Tombot and another companion robot company, Ageless Innovations, are trying to fill that gap with lifelike robots that don't break the bank. Tombot's pup will retail for $500. Ageless Innovations's "Joy for All" cats and dogs are less realistic but cost only $100. But is it really possible to create a low-cost robotic pet that owners will dote on? Many robots designed to look like the real thing turn out creepy rather than lovable — a phenomenon roboticists know as the uncanny valley. Stevens said the trick was to focus on a small set of realistic behaviors: Tombot's puppyish head movements, facial expressions and that constantly wagging tail. The rest — like appearing to breathe — can fall by the wayside. In any case, Moreno said robot companions should be used to supplement interactions with loved ones and caregivers — not replace then. Interacting with a robopet might not work for all dementia sufferers, Sixsmith added, "but if it helps some people, then great." WANT MORE STORIES ABOUT THE FUTURE?